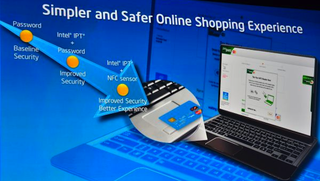 Today at the Intel Developer Forum, MasterCard joined the chipmaker onstage to talk about electronic payments. Beneath all the marketing speak and generic statements however was a wonderful revelation: the two companies are going to partner up and give merchants and laptop makers the necessary technology they need to act as credit card terminals. What this means for you, the online shopper, is that you no longer have to store your credit card info online (or enter that hellacious number every time). Instead, you just tap your card or phone to your computer and get on with your day. As a demo, the two companies gave an example of how someone might buy a thing on TigerDirect. It ends with someone tapping a credit card on a trackpad. Simple as that. This may seem minor on the surface, but consider the benefits. Obviously you save time. And if an account gets hacked, you don't have to worry about someone buying things with your account. Plus, when you get a new card, you don't have to go through each and every online account and update your info. Sure, this is an idea that's not quite ready for the primetime, but it's a future vision that's very, very plausible, if not likely. The Intel-Mastercard union aside—one that is already influential on its own—there are plenty of other reasons which indicate why we'll probably be using this technology in our day to day lives. For starters, we're already in the midst of a mobile payment revolution. Using PayPass in stores, Square with small merchants, and Google Wallet on our phones (and all the companies who followed after), electronic/NFC-based payments are less and less of a foreign thing to the average consumer. Secondly, Apple is about to join the party with its Passbook feature. And while it might not be the first or greatest implementation of this idea, it will certainly help push it mainstream. And with more and more phones and PCs coming equipped with NFC, the technology will be there en masse (meaning merchants can spend time and money integrating the feature knowing more than 10 people will use it). It may not be be something that will change our lives radically, but it is one that will make our lives easier (I mean, who doesn't buy stuff online with regularity?). And for that reason alone, I'm excited for the day when I can buy stuff online with a tap.